September 25, 2015 marked a global watershed, as world leaders from 193 countries adopted the 2030 Agenda for Sustainable Development. It will apply valuable lessons learned from recently completed strategies of the fifteen-year Millennium Development Goals. This paper focuses on women's health and wellbeing, covered in all 17 Sustainable Development Goals, but emphasized in the fifth - "Gender equality and women's empowerment." After careful and thoughtful consideration of how the new goal may be implemented, this paper develops an interesting model depicting women and girls as central protagonists in effecting positive health and life-affirming changes in their own lives. The model emphasizes the protective umbrella paradigm of interwoven, multi-sectoral and reciprocal relationships. It illustrates how 2030 agenda implementation is aided by forging significant, peculiar, intricate, multi-dimensional and essential collaborations, including donor communities; national, regional, state and local governments; individuals, nuclear and extended families, community leaders, heads of social institutions; civil society organizations, and most critically, women and girls everywhere. The paper suggests how to initiate and bring into effective action the processes that will lead to these new enhanced changes for women and girls in each locality. Health promotion and health education theories will be invaluable tools. Sustainable development goals, Women and girl's empowerment, Women and girls as central protagonists, Gender equality, Women's health and maternal health, Essential multi-sectoral collaborations. September 25, 2015 marked a global watershed and new beginning, with a climactic turning point for 2012 originated plans. World leaders from 193 countries finally signed on to ratify and adopt the 2030 Agenda for Sustainable Development . This paper primarily focuses on women's health and wellbeing, covered in all 17 Sustainable Development Goals (SDGs), but particularly, in the fifth (SDG 5) - Gender equality and women's empowerment . (2) Use SDGs agenda as the basic and essential supporting structure that is intrinsically an underlying theoretical framework, and considering possible translational vagaries at implementation; develop a new interesting model that depicts the woman and girl as central protagonists in effecting positive health and life-affirming changes in their own lives. This model emphasizes the protective umbrella paradigm of interwoven, multi-sectoral and reciprocal relationships. (3) Give importance to the fundamental notion that the proposed monumental SDGs mandate must be supported by women everywhere, in partnership with their multi-sectoral and multidisciplinary teams of collaborators. (5) Illustrate the relevance of the SDGs and this new model, thereby summarizing a careful and thoughtful consideration of SDGs in relation to women's health and wellbeing, particularly focusing on the new SDG 5 - "Gender equality and women's empowerment." How can this model help to begin operationalizing SDG 5 constructs within communities? How can this model and the paper's suggestions help to equip program personnel and service providers with conceptual elements and selected tools for successful SDG 5 implementation, through concerted partnership with women, girls, who are the proposed program recipients and primary targets of SDG 5? The SDGs 'seek to realize the human rights of all and to achieve gender equality and the empowerment of all women and girls; a world in which every woman and girl enjoys full gender equality and all legal, social and economic barriers to their empowerment have been removed' . All seventeen SDGs working together will ensure holistic and sustainable development in all communities. 'The interlinkages and integrated nature of the Sustainable Development Goals are of crucial importance in ensuring that the purpose of the new Agenda is realized' . For example, incontrovertibly, women's health would be positively influenced with No poverty (SDG 1), Zero hunger (SDG 2), Good health and well-being (SDG 3), Quality education (SDG 4), Decent work and economic growth (SDG 8), Reduced inequalities (SDG 10), and SDG 17: Partnerships for the goals. Figure 1, items A - E in this current paper shows the interwoven, multi-sectoral and reciprocal relationships that indicate a strong need for unprecedented collaborations. • 'The achievement of full human potential and of sustainable development is not possible if one half of humanity continues to be denied its full human rights and opportunities' . • 'Women and girls must enjoy equal access to quality education, economic resources and political participation as well as equal opportunities with men and boys for employment, leadership and decision-making at all levels' . • 'The systematic mainstreaming of a gender perspective in the implementation of the Agenda is crucial' . • 'Women's empowerment is a strong tool that contributes and leads to societal progress, sustainable development and assures the achievement of full human potential' . The SDGs are timely and relevant everywhere, helping to achieve and move along the agenda that empowers women, and improves the life and health status of girls, young women, mothers, and older women in communities worldwide. Additionally, past trends of declining maternal mortality underpin the strong hope that preventable maternal mortality will cease by the 2030 SDGs end date . SDGs will continue the strong initiatives and strategies implemented during the previous fifteen-year lifespan of the Millennium Development Goals (MDGs) . Lessons learned from the implementation of MDGs are applicable to the new SDGs global program agenda . Develop a new interesting model that depicts the woman and girl as central protagonists in effecting positive health and life-affirming changes in their own lives. This model emphasizes the protective umbrella paradigm of interwoven, multi-sectoral and reciprocal relationships. The model arises from a careful and thoughtful consideration of SDGs in relation to women's health and wellbeing, with a particular focus on the strong support for women demonstrated in the new SDG 5 - "Gender equality and women's empowerment ." In this new model, Figure 1 shows several components including five box items (A through E) with inter-connecting arrows that indicate the inextricable reciprocal collaborations and relationships that must be forged for SDGs implementation. The largest Box Item A represents the woman's central role. Going in a clockwise direction, Box Item B represents an amalgam of support for women and girls' empowerment/health issues with a brief listing of selected critical initiatives. Next, Box Item C lists SDG 5 targets; Box Item D represents possible roles for individuals, nuclear and extended families, and other community members; and finally, Box Item E represents the national, regional, state and local governments' involvement. 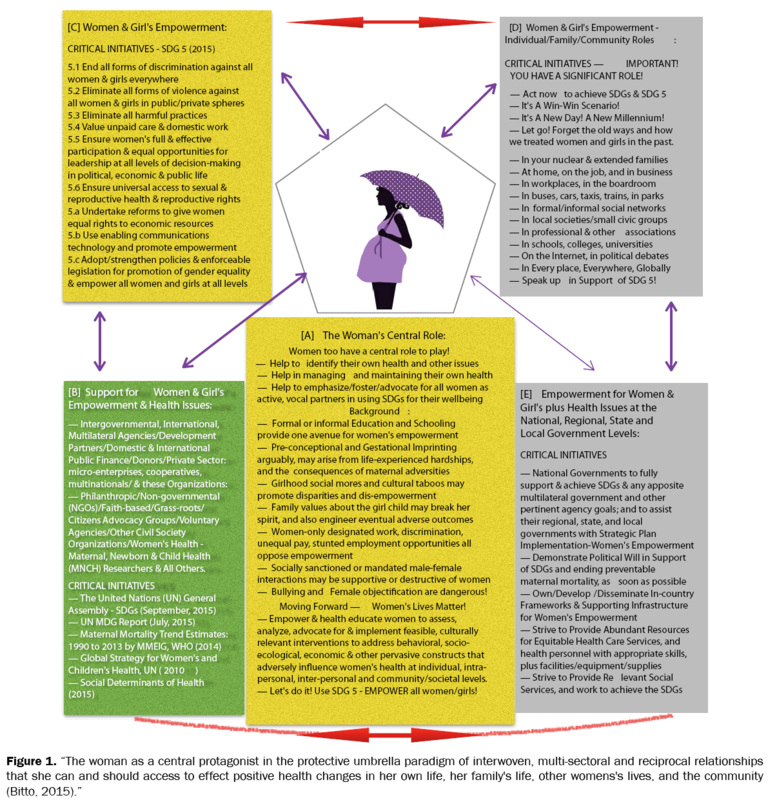 The model (Figure 1) depicts the woman and girl as central protagonists, in the protective umbrella paradigm of interwoven, multi-sectoral and reciprocal relationships that a woman can and should access to effect positive changes in her own life and health status. Taking up for herself, in partnership with supportive collaborators, the woman and girl can become critical change agents that help to achieve SDG 5 (Figure 1 - Box Item C) in their local community. Thus, each woman has a central role to play with SDGs program implementation. Women and girls cannot afford to be passive recipients with SDGs, for they have the experiences that may inform SDGs implementation. Women and girls of all ages can provide valuable insight that could be essential to formulating and executing SDG 5 strategies in each woman's specific locale. Furthermore, women may also reach out to involve other disenfranchised women and girls, and set/keep the ball rolling with local SDG 5 strategies. Figure 1 - Box Item A shows selected background elements for women, with suggestions for empowering women, by amplifying the unique perspective that each woman has accrued over time. Figure 1 also depicts the woman facing the SDG 5 targets (Box Item C), looking forward with longing, hope and expectancy for all the benefits that will accrue from SDG 5. Symbolically, using the unfurled umbrella to protect her, the woman's back is turned away from community elements represented in Box Item D. Although this box D signifies future expected changes, it may also remind the woman of prior or continuing adversities she had/has to endure from the community, including social structures. Figure 1 - Box Item B lists selected support categories for women and girl's empowerment and health issues, for example, intergovernmental, international and multilateral agencies, development partners and civil society organizations. Next, Figure 1 - Box Item C provides a concise summary of SDG 5 and its targets that comprehensively address issues affecting women and girls everywhere - end discrimination; eliminate violence and all harmful practices; raise the value attached to work that is typically associated with women - unpaid care and domestic work; provide equal opportunities for leadership in political, economic, and public life; ensure universal access to reproductive health and rights; with reforms that ensure equal rights to economic resources; promote women's empowerment through enabling communications technology; and promote gender equality and empower all women and girls at all levels . See Figure 1 - Box Item D for another group of key participants and partners including individuals, family members, community members, and all others in society who play a definite and prominent role of paramount significance for achieving SDG 5. Figure 1 also presents a list of suggestions on what these people may do, how they may take action, when and where regarding SDG 5 program implementation. Last, but not the least, of essential collaborators are the national, regional, state and local governments, with selected suggested roles provided in Figure 1 - Box Item E. Of critical importance is the need for national governments to fully own, support and implement sound and achievable strategies for successful SDG 5 programming. Governments may also elect to be objective and analytic about women's health and empowerment issues, in order to support all active players/change agents whether they are individual men and women, or family and community organizers, local community representatives, civil societies, private and public consortia, or multilateral and international agencies/donors that all support women's health initiatives. Give importance to the fundamental notion that the proposed monumental SDGs mandate must be supported by women everywhere, in partnership with their multidisciplinary teams of collaborators. The model's numerous and bi-directional arrows help to illustrate how implementation of the 2030 agenda is dependent on forging significant, peculiar, intricate, multi-dimensional and essential collaborations, including donor communities; national, regional, state and local governments; individuals, nuclear and extended families, community leaders, heads of social institutions; civil society organizations, and most critically, women and girls everywhere. As depicted in Figure 1, the various identified categories in each box all link to the central figure - women and girls, whose support and unfettered active participation is essential for successful SDGs implementation. Additionally, Figure 1 shows other inter-category relationships that support the SDGs. For example, existing or prior relationships between international/multilateral donors and national governments may determine the level and type of funding provided for SDG 5 implementation. Donors will also have skilled expertise to share. Likewise, national governments play a critical role with educating, guiding and directing communities, as well as, formulating and enforcing pertinent legislation to ensure that communities are implementing SDG 5. Thus, it is important for community elements to understand SDG 5 and its targets, yet another connection that must be ensured through education and other means, please see the top linkages of Figure 1. Another critical link reflects the need for ensuring a unified vision among all supporters of women's empowerment during SDGs implementation. Whereas donors, philanthropic, and other supporting entities may need to focus on different aspects of the SDGs mandates that are consistent with their own individual organizational missions, it is important for all to share the same unified overall vision for SDGs implementation. Finally, each group must ensure that the women and girls in each target population have a say and actively participate with SDG 5 implementation in their locale, to ensure that needs are appropriately met in each specific situation. How to initiate and bring into effective action the processes that will lead to these new enhanced changes for women and girls in each locality, noting that health promotion and health education constructs and theories will be invaluable tools;. The prior section outlined the need for education on SDGs for a wide group of stakeholders. Additionally, involving women in local SDG 5 implementation will need collective action, to reach out and seek the participation of both individual and small groups of women, using a relevant and culturally sensitive approach that reaches women and girls where they live within each locale. Despite any anticipated or unexpected challenges, it is of paramount importance to educate and motivate women about the SDGs, what SDGs mean for their lives, and the interwoven, multi-sectoral and reciprocal relationships that they can and should access to effect positive changes in their own lives and health status. Contingency plans should be developed for overcoming barriers. It is important to involve all women across all age groups with SDGs in their own languages, wherever the women are located geographically, socially, culturally, educationally, intellectually, and metaphorically. Relevant-for-locale SDG 5 materials may be presented by appropriate and trained change agents, and health promotion specialists. Professional organizations (including faithbased organizations, home-bound mothers and their children's play date groups/market women's groups/office workers/nurses/ service professionals/housekeepers/seamstresses/hairdressers/restaurant workers) may all provide direct access to women for sharing about the importance of SDG 5, and the need for grass roots acceptance to ensure effective program implementation. Initiatives will need to emanate from donor and governmental agencies, non-governmental (NGOs) and faith-based organizations, grass-roots and citizens advocacy groups, voluntary agencies, and other civil society organizations. Additionally, women may be reached through health care service organizations, educational institutions, their mobile devices and social media. Mobile devices and social media comprise another set of tools for SDG 5 implementation: since 'there is broad agreement that access to communication is an essential component of improving the use and quality of maternal health services,' . However, local opinion leaders and gatekeepers (both male and female) should be approached regarding SDG 5 implementation strategies in their locale. Outreach strategies to women may include both quantitative and qualitative techniques - using surveys and need assessments, focus groups, and social media. Staff training and hiring of appropriate personnel is another key component. SDG 5 implementers will benefit from listening to women and girls regarding their felt needs, understanding of their sociocultural milieu, and how best to proceed with SDG 5 implementation. Experts' prior experience and knowledge of effective strategies may not necessarily be relevant in every situation across the globe. Hence the need to take into account women and girls - the target populations' counsel, opinions and their recommendations for project implementation. Donors may wish to start by funding planning grants that will precede full project funding, in order to gather relevant information on existing enabling factors or specific local quirks, pitfalls to avoid and other mitigating circumstances. All this information may then be used for planning and implementation of the full program. Additionally, it will be important to include mechanisms for sharing lessons learned at each stage of SDGs implementation. Enabling constructs will include the deployment of relevant health promotion and health education theories and planning models, to aid with selection of implementation designs and procedures, and a compilation of the best set of interventions. SDGs program personnel and service providers may elect to use planning models such as PRECEDE-PROCEED and social marketing models . In the first step, practitioners will document women and girls' needs that must be addressed during SDGs implementation in each specific locale. Social marketing involves consumer research and market analyses, and the PRECEDE-PROCEED model includes a comprehensive epidemiological assessment combined with behavioral, educational, environmental, and organizational diagnosis; and administrative and policy assessment. The new model presented in this paper provides several topic areas and concepts that may be interwoven through the processes, while working to finalize actionable intervention strategies and a suitable evaluation plan, with measures for quality control and improvement. During finalization of the intervention strategy, health promotion and health education theories may prove useful for achieving specific SDG 5 targets, and helping to change people's behavior or effect changes in the environment. Depending on the community and implementation phase, SDGs program personnel and service providers may select and deploy the most appropriate of the following health promotion and health education theories. Individual level theories include the health belief model, stages of change model, theory of planned behavior and precaution adoption process model. Social cognitive theory functions at the inter-personal level; and community level theories include communication theory, diffusion of innovations, and community organization (policy changes and media advocacy campaigns) . Illustrate the relevance of the SDGs and this new model, thereby summarizing a careful and thoughtful consideration of SDGs in relation to women's health and wellbeing, particularly focusing on the new SDG 5 - "Gender equality and women's empowerment." Selected examples and illustrations are presented below. The electronic search strategy: In the first phase, a web-based generic Google literature search on the term 'Women's health and well-being,' yielded numerous articles on reproductive health issues, communicable and non-communicable diseases, exercise programs, addictions, and other topics. From this springboard, additional relevant search terms were developed for this study including 'Sustainable Development Goals,' 'Millennium Development Goals,' 'SDGs and MDGs,' 'Women's health in developing countries,' 'Women's health in developed countries,' 'Maternal health,' 'Women's Empowerment,' 'Gender Equality,' 'Maternal, neonatal and child health,' and 'Social Determinants of Health.' Searches were conducted on PubMed (https://www.ncbi.nlm.nih.gov/pubmed), POPLINE (http://www.popline.org/), Google Scholar (https://scholar.google.co.in/) and Sage Journals (http://online.sagepub.com/). Selection and exclusion criteria for articles included the publication date (2000 -2015), relevancy to this current study and the topic under consideration. Masters theses and doctoral dissertations were excluded from this analysis. The selection was limited to English language articles. About 289,000 maternal deaths were recorded worldwide in 2013, representing a 40 percent reduction from 1990 . The sub-Saharan Africa region alone accounted for 62% (179 000) of global deaths followed by Southern Asia at 24% (69 000). One third of all global maternal deaths occurred in two countries, India at 16% (50 000) and Nigeria at 14% (40 000) . To assess progress with the MDG 5 using data for 181 countries, Hogan et al. evaluated variations in maternal mortality from 1980-2008 and demonstrated that these deaths still pose a significant problem . They also identified the need for reliable information sources on maternal deaths, which may pose a challenge as the new SDGs are implemented globally. Kalizeta's story is a case study from Burkina Faso . Kalizeta lost her index pregnancy to a stillbirth, but despite receiving health care for complications during that pregnancy, the final cost was too high for both Kalizeta and her family. Combined with adverse structural constructs in her community that contributed to her demise, she finally succumbed in the next pregnancy. Kalizeta was just 'too poor to live!' Likewise, Filippi et al. highlight the 'economic and social vulnerability of pregnant women,' which leads to a call for multi-sectoral interventions . This case study above supports SDGs holistic and all-encompassing community goals for wellbeing, health, wealth, and life in all of its dimensions. It is possible to speculate that if SDGs had been implemented before their time, Kalizeta might have survived. The SDGs address these situations, including poverty reduction and women's empowerment. Using the model presented in this paper, SDGs program managers will be able to carefully analyze the scenarios presented in these examples, as a guide to directing where interventions are most needed and for selection of appropriate interventions. This may be followed by selecting an appropriate health promotion and health education theory for a targeted intervention that will address the identified needs. For example, increase reproductive health services and health education for birth spacing and/or prevention of too many births that overwhelm mothers. 'Everyone has a critical role to play in improving the health of the world’s women and children' . Women's decision-making power and having a say did significantly influence and increase their use of modern contraceptives . Thus, as emphasized in the model, women's role in SDG 5 implementation must not be overlooked or undervalued. Additionally, SDG 5 implementation may be informed by a combination of strategies and lessons learned from prior programs. For example, where development quotas were utilized to increase women's involvement in a highly conservative society, a study did demonstrate some improvements with regards to women's economic, social, and political participation . However, the development quotas did not produce a shift or movement towards more egalitarian views about women's societal roles and family decision-making. In 2010, about 75 percent of all female workers in the more developed countries were employed in the services sector; and although the scope of jobs for women had broadened over time, women were still less likely to be employed in jobs with status, power and authority - including legislators, senior officials and managers . Furthermore, this differential distribution in job allocation led to generalized and enduring gender pay gaps. Note women's dual job roles at home and at work, with women spending about double the time men spent on unpaid domestic work. Similarly, in their own homes girls were more likely than boys to be involved with domestic work. From cross-sectional surveys of Latina women in California, Wang et al. observed that after adjustment, race/ethnicity, education and income were independently associated with low fruit and vegetable consumption; and this required interventions at several levels including cultural, economic, and issues related to transportation and the built environment . Additionally, in the U.S. recent twists to female social activism include plans for a conference themed 'Black Women and Girls’ Lives Matter.' that will 'bring together scholars, educators, activists, students, artists, and community members to dialogue on pressing social problems,' . At issue is advocacy to fully address and meet felt needs through empowerment of women and girls of color . Likewise, other female activists are involved with several campaigns to raise awareness about issues of public officials' brutality and outrages committed against this section of society. The goal is to bring about criminal justice reforms and enforcement of a zero-tolerance policy for sexual assault and harassment, in order to improve the plight of black women and girls . Another perspective of empowerment derives from Carr who addresses the needs of an older population of women, the grandmothers who take primary responsibility in caring for their grandchildren . Carr recommends an education-based strategy for empowerment with 'self-improvement, decision-making skills improvement, self-advocacy, advocacy for others, and political activism' . The SDGs are designed to address such issues. They provide an all-encompassing and supporting framework that also addresses women's issues in developed countries. Activists and women's advocates can adopt the SDGs mandate as a tool and work in tandem with their national, regional, state and local government authorities, and in collaboration and partnership with other civil society organizations to implement SDG 5 women's empowerment initiatives. Using the model presented in this paper, program implementers can allocate issues to a specific box and also determine which box houses potential avenues for interventions. Figure 1 - Box Item A addresses how women can act and be a part of the solution, Box Item B identifies additional sources of support including philanthropic agencies and faith-based organizations, Box Item C invokes the SDG 5 targets, Box Item D references individual, family and community actions, and finally, Box Item E identifies governmental interventions. From an Indian case study of the Dead Women Talking Initiative, Khanna and Subha Sri showcase the important role of social determinants of health in maternal deaths . Individual characteristics - younger and primiparous or low parity women died, as did pregnant women working for prolonged periods in physically demanding occupations e.g. as wage laborers or in agriculture. Community factors implicated among the deceased included particular castes or religion, and living in remote hamlets. Gender based issues were revealed in social stigma, lack of health care, son preference, and women's lack of decision making powers. Health system factors included lack of obstetric facilities, antenatal and postpartum care, referrals/emergency transport . These are not isolated reports. In India, Gupta et al. identified the following predictors of maternal death: hemorrhage, obstructed labor, severe anemia, puerperal sepsis, abortion, antenatal complications, home deliveries, young age at child birth, and poverty . Additional factors identified in Nigeria include lack of antenatal care, high parity, high-risk pregnancy, emergency caesarean delivery, and low levels of maternal education . These grim findings buttress the very real need for worldwide implementation and achievement of the SDGs. Furthermore, no discourse on sustainable development can avoid the social determinants of health. Limited consideration of these factors may have contributed to unrealized impacts and outcomes of development agendas such as the MDGs . Social determinants of health include conditions of daily living and structural determinants in the society that explain many health inequities . Structural determinants include the socioeconomic and political context of daily living -- governance, macroeconomic policies, social policies on the labor market/housing/land; public policies on education/health/social protection; culture and societal values - which interact with the individuals' socioeconomic position - their social class, gender, ethnicity/racism, education, occupation and income resulting in specific living and working conditions/food availability, that finally produce behaviors and biological/psychological factors that impact equity in health and wellbeing . Implementation of the SDG 5 and the other SDGs is essential for meeting society's critical needs. A multi-national analysis of Demographic and Health Surveys from 31 countries demonstrates the relevancy of these all-encompassing SDGs to address pressing global issues . Adaptation to change for sustained progress. SDG 5 is relevant globally. However, in some regions, challenges may be posed by the scarcity of resources that will mandate hard decisions by finance ministers and heads of state, who may be faced with conundrums regarding which SDG 5 services to offer first, given the numerous competing essential community needs. In the developing countries there is a strong need to strengthen vital registration systems and other valid data and information gathering systems. MDGs measurement of progress has been supported by several partner agencies [28-34]. 'Information must be available in order to be used for programme management, planning and evaluation purposes, and it must be used in order to make a difference in the lives of women and children' . The following recommendations for the implementation phase of the SDGs are modified from Giles . • In addition to governments, the women, community members and civil society organizations all need to own the SDGs, support it, and be fully engaged when each country, region, state, local government or small community plans, implements and evaluates strategies for achieving the SDGs. Finally, at issue are this paper's research questions pertaining to (1) how this new model can help to begin operationalizing SDG 5 constructs within communities, and (2) partnership structures during SDGs implementation. The model presented here does offer design specifications for operationalizing SDG 5 constructs for implementation within communities. This is substantiated by the discourse and examples provided above. Additionally, it is crucial to partner with the women and girls who are the primary beneficiaries of SDG 5. Women's direct, active involvement (not just as program recipients) during all phases of program planning, implementation and evaluation will help assure that women's needs will be met. Again, women must be central protagonists and collaborators along with SDG program organizers, donors, governmental and non-governmental agencies and other supporters of SDG 5 - Gender equality and women's empowerment. As identified globally , but particularly in the developing world, much needs to be done for women's socio-economic and other empowerment. An additional component includes the establishment of initiatives that fully recognize and support the central role that women play in improving their own lives and health. Women do have a say, must speak up about their needs, and proceed towards working to enhance cultural and societal constructs that support women's health and wellbeing, and to ameliorate detrimental factors in their society. The time is now for women everywhere to stand up and take up for their own health, even as the SDGs provide the supporting framework. In the model, Figure 1 provides suggestions on how women and other entities can play a role; and emphasizes how the 2030 agenda and SDGs program implementation will rely on the significant, peculiar, intricate and multi-dimensional partnerships, relationships and essential collaborations that must be forged in each location. This will include the donor community; national, regional, state and local governments; individuals, nuclear and extended families, other members of society, community leaders, heads of social institutions; civil society organizations, and most critically, women everywhere. The far-reaching expected outcomes of the SDGs agenda implementation, particularly SDG 5, provide an unprecedented global opportunity to empower each and every woman for overall life status improvements, optimal health status and desirable maternal outcomes that will bring tremendous and enduring benefits to all societies. For the intriguing pregnant woman silhouette clip art, thanks go to the developers working in association with Public Domain Pictures.net created by Bobek Ltd.
General Assembly resolution 70/1, Transforming our world: the 2030 Agenda for Sustainable Development, A/70/1 (25-27 September 2015). Available from undocs.org/A/RES/70/1. United Nations. Partnerships for Sustainable Development Goals - 17 Partnerships, October 2015. United Nations Department of Economic and Social Affairs Division for Sustainable Development. Bustreo F, et al. Ending preventable maternal deaths: the time is now. The Lancet Global Health. 2013;1:176–177. United Nations, The Millennium Development Goals Report 2015, 1 July 2015, ISBN 978-92-1-101320-7.
WHO, UNICEF, UNFPA, The World Bank and the United Nations Population Division. Trends in Maternal Mortality: 1990 to 2013. Estimates. Geneva: World Health Organization, 2014. Noordam AC, et al. Improvement of maternal health services through the use of mobile phones. Tropical Medicine & International Health. 2011;16:622–626. National Cancer Institute. Theory at a Glance: A guide for health promotion practice. (Second Edition). United States Department of Health and Human Services, National Institutes of Health, 2005. Hogan MC, et al. Maternal mortality for 181 countries, 1980-2008. A systematic analysis of progress toward Millennium Development Goal 5. Lancet. 2010;375:1609-1623. Storeng KT, et al. Too poor to live? A case study of vulnerability and maternal mortality in Burkina Faso. Global Health Promotion. 2013;20:33–38. Filippi V, et al. Maternal health in poor countries: the broader context and a call for action. Lancet. 2006;368:1535-1541. Beath A, et al. Empowering Women through Development Aid: Evidence from a Field Experiment in Afghanistan.American Political Science Review. 2013;107:540-557. United Nations, 2010. The World's Women 2010: Trends and Statistics. New York: United Nations, Department of Economic and Social Affairs, Statistics Division. Sales No. E.10.XVII.11. United Nations, 2015. The World's Women 2015: Trends and Statistics. New York: United Nations, Department of Economic and Social Affairs, Statistics Division. Sales No. E.15.XVII.8. Wang M, et al. Social disparities in dietary habits among women: Geographic Research on Wellbeing (GROW) Study. Public Health Nutr. 2015;17:1-8. The Ohio State University College of Arts and Sciences. 2016 Conference on Hiphop Literacies: Black Women and Girls’ Lives Matter: Wednesday, March 30, 2016 to Thursday, March 31, 2016 at the Frank B. Hale Jr. Black Cultural Center, Main Campus. Kali Nicole Gross. 'Will Sandra Bland's Case Finally Make Black Women's Lives Matter?' [Blog Posted: 07/23/2015 2:15 pm EDT Updated: 07/23/2015 2:59 pm EDT.]. Carr GF. Empowerment: A Framework to Develop Advocacy in African American Grandmothers Providing Care for Their Grandchildren. ISRN Nursing. 2011 (2011), Article ID 531717, 7 pages. Renu K and SubhaSB. Social determinants approach to maternal deaths, India. CommonHealth India. 2013. WHO/SEARO/Payden. Gupta SD, et al. Maternal mortality ratio and predictors of maternal deaths in selected desert districts in rajasthan a community-based survey and case control study. Womens Health Issues. 2010;20:80-85. Fawole AO, et al. Predictors of maternal mortality in institutional deliveries in Nigeria. Afr Health Sci. 2012;12:32-40. World Health Organization. Joint statement of the UN Platform on Social Determinants of Health, Health in the post-2015 development agenda: need for a social determinants of health approach. Commission on Social Determinants of Health. Closing the gap in a generation: health equity through action on the social determinants of health. Final Report of the Commission on Social Determinants of Health. Geneva, World Health Organization, 2008. Solar O and Irwin AA conceptual framework for action on the social determinants of health. Social Determinants of Health Discussion Paper 2 (Policy and Practice). Geneva, World Health Organization, 2010. Ahmed S, et al. Economic Status, Education and Empowerment: Implications for Maternal Health Service Utilization in Developing Countries. PLoS ONE. 2010;5: e11190. Hunt P, et al. Women's and Children's Health: Evidence of Impact of Human Rights. World Health Organization 2013. Victora CG, et al. Countdown to 2015: a decade of tracking progress for maternal, newborn, and child survival. Lancet. 2015; PubMed ID 26477328. United Nation’s Commission on Information and Accountability for Women’s and Children’s Health. Keeping Promises, Measuring Results. Geneva: World Health Organization, 2011. The WHO Application of ICD-10 to deaths during pregnancy, childbirth and the puerperium: ICD maternal mortality (ICD-MM). Geneva: World Health Organization; 2012. Hill K, et al. How should we measure maternal mortality in the developing world? A comparison of household deaths and sibling history approaches. Bull World Health Organ. 2006;84:173–180. WHO guidance for measuring maternal mortality from a census. Geneva: World Health Organization; 2013. Maternal death surveillance and response: technical guidance. Information for action to prevent maternal death. Geneva: World Health Organization; 2013. Giles WH. Preventing non-communicable diseases in sub-Saharan Africa. Global Health Promotion. 2010;17:1757-9759.